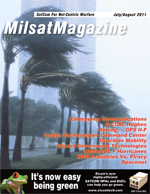 Home >> January 2008 Edition >> Military Satellites and RocketsNo More Failures! Military Satellites and RocketsNo More Failures! In 1974, the U.S. Air Force contracted with Rockwell International (now Boeing) to design and build the first 12 Global Positioning Satellites (GPS) called Block I. There were already two other satellite-based navigation systems in service at the time used by the Navy, TIMATION and TRANSIT, packed with the finest available voltage-controlled oscillators (VCXO) available for on board timing. GPS was designed to exceed existing satellite based navigation system performance as well as to meet the navigation needs of all the military branches. The Air Force was motivated to obtain full DoD funding for GPS. The GPS satellites use atomic clocks for timing generators. The generators stabilize a 10.23 VCXO; from which the L-band navigation downlinks are derived to the accuracy necessary to out perform existing satellite based navigation systems. In 1974, atomic clocks had never been flown in space and were the least reliable component of the GPS satellite payload. All the necessary modifications for formerly ground-only based clocks to operate in space had not been completely defined. Existing atomic clocks excited either rubidium or cesium atoms, which emit RF energies at specific frequencies and at specific rates that are so dependable, our second of time is defined by it. Rubidium and cesium atomic clocks have opposite performance behavior and the air Force had not yet decided which to use on a permanent basis. A cesium atomic clock uses as a reference the exact frequency of the microwave emitted energy emitted by atoms of cesium in resonance, in particular its isotope of atomic weight 133. The integral of frequency is time, so this frequency, 9,192,631,770 hertz, was defined as 1 second and provides our fundamental unit of time. In 1978, the GPS engineering team, on contract to the U.S. Air Force, were asked to both to define the on orbit support requirements as well as to predict the operational stability of each satellite atomic clock. This would enable critical, system wide testing, which could be planned during times when the atomic clocks were the most stable. In this way, the GPS system performance could be best determined when each satellites atomic clock was performing at its best, thereby increasing the likelihood of exceeding the existing satellite based navigation systems performance. Having access to the GPS Kalman filter performance, which illustrated each satellites on board clock behavior from the GPS Master Upload Station located at Vandenberg Air Force Station, the GPS engineering team was able to predict atomic clock failures using telemetry prognostics. Kalman filtering is a mathematical process for predicting future behavior from past behavior by incorporating real-time updates. As we were building, launching and operating GPS satellites in space, the engineering team had available all of the information necessary to engage in telemetry prognostics. Prognostics should have been developed after the development of the strip chart recorder in 1958, when it became possible to easily display and analyze large quantities of analog telemetry. However, no one asked the builders of Americas aircraft, missiles and rockets at that time to, in fact, do so. For almost 50 years, the U.S. military has been buying, launching and operating satellites in space in support of our nations security. During that time period, the process for designing, testing, launching and operating satellites has changed very little. Although many new tools and materials are used, the procedure for such activity has remained unchanged. Post event analysis of test data. Equipment diagnostics were used during rocket motor testing in the 1940s and 1950s. Rocket motors in development were instrumented with expensive and complex data generation systems for measuring voltages, currents, pressures, temperature, accelerations and force. Huge amounts of test data were recorded and analyzed after the rocket motor ignition to determine if the motor was functioning properly. At first, data was logged by hand by huge groups of people hired to write down the information as it was being created. Francis L. Moseley conceived the idea of an x-y recorder using standard-size graph paper after the drudgery of writing down columns of data, plotting graphs and drawing smooth curves. In 1951, he marketed the first 2-axis strip chart recorder, which he built in his garage. This device allowed the recording and simultaneous display of test data on long sheets of paper and was a great boon to the flight test and rocket engineers. Data was collected in real-time, processed and analyzed after each test. Most of todays military rockets began life as highly unreliable intercontinental ballistic missiles (ICBMs). In a hurry to field ICBMs after Russias Joseph Stalin built the worlds first ICBM with a nuclear bomb payload in 1953, the U.S. played catch-up. Eventually, the Russian military missile program beat the U.S. into space with the successful back-to-back launch of 2 Sputnik satellites. In 1953, the U.S. military developed a list of 100 targets for ICBM engagement. The reliability of the first 2 ICBMs, Atlas and Titan, were so low the military determined they would need at least 4 ICBMs to hit one target with the assumption of only a 70 percent chance of target strike success. Instead of winning a production contract for 100 missiles, each missile contractor won contracts for 400 missiles. This action led to the acceptance in the aerospace industry that launch failures were not only acceptable, but also quite normal. Contractors such as Martin and Convair benefited greatly by the militarys decision for multiple missiles, as any increases in missile reliability meant a reduction in orders. In the late 1950s, as jet planes flew faster and faster, flight failures meant pilots were being killed during mishaps. Unable to find out why the pilots were crashing, flight test engineers added telemetry instrumentation systems to send engineering data to ground personnel during tests flights. Remote ground stations were added to collect telemetry when the jets were far from the landing strips. Flight test engineers then began adding telemetry instrumentation to missiles at about the same time, as well as with command destruct systems for out of control missiles. In 1957, stored Titan missiles had been exploding, killing the soldiers stationed in the silos. The Air Force retired the dangerous Titans and replaced them with the less volatile Atlas and others. In 1960, when the technology was available to predict each missile performance, everyone had already accepted as fact launch failures were to be expected  nothing could be done about the failures. Prognostic technology was, simply, not developed. In 1961, the U.S. government decided to use the Titan missiles as launch vehicles for military satellites. This was seen as a method to increase access to space as well as reducing the massive financial losses of the original 400 Titan ICBM purchases. NASA refused to use the Titan missiles for its satellites and instead choose the Thor missile, a much smaller, less capable missile. Many of the same contractors who had designed and built the U.S. jet aircraft also designed and built missiles, rockets and satellites. This meant the same design and test practices used in the aircraft development were used in all space applications. Using telemetry systems is expensive and complicates vehicle design. Due to its high cost and electrical complications to the vehicle, telemetry has been relegated to simple diagnostic function use only. For decades, telemetry has been used to determine flight equipment status during equipment manufacturing and testing and also for completing customer acceptance testing on satellites and launch vehicles before shipping them to the launch pad. After the creation of telemetry prognostics in the 1980s, the benefits of prognostics could be realized. Prognostics allows for the identification and repair or replacement of unreliable piece parts and electro-mechanical components at the factory or on the launch pad, all prior to launch. As most of the equipment testing at the factory is designed to identify equipment that has failed, prognostics allows for reduced testing, shortening delivery schedules, and reducing labor hours. During on orbit satellite operations, infant mortalities can be stopped because all equipment that was to fail soon after launch would have been identified on the ground and repaired or replaced before the launch. During on orbit operations, future equipment failures will be identifiable and equipment use can be modified so that such failures do not mitigate payload services. Dr. Len Losik is President of Failure Analysis and offers telemetry prognostic technology for licensing for use with satellites and launch vehicles. He can be reached at: lenlosik@failureanalysisco.com and www.failureanalysisco.com. Dr. Losik has also written two books on this subject, available from bookstores as well as AMAZON.com. They are entitled, Predicting Failures & Measuring Remaining Usable Life for Highly Reliable Aerospace Equipment, ISBN 978-0-9741358-4-7 and An Introduction To Predicting Failures & Measuring Remaining Usable Life for Highly Reliable Aerospace Equipment, ISBN 978-0-9767491-9-6.